Air Cadets across the country are preparing to sing the praise of the RAF in Concert tour - the final chance to celebrate RAF100. Eleven Squadrons* from across the country are showing their support for the final RAF centenary salute by selling programmes at their local concert venue. The RAF in Concert tour will be the last official event marking the centenary and will feature an entertaining programme of music that showcases the performers' virtuosity as well as reflecting the modern Royal Air Force of today. The programme will include a list of the night's events and exclusive features that celebrate the Royal Air Force's history - including the 75th anniversary of the Dambusters Raid and the RAF100 salute on 10 July 2018. There will also be information about the RAF bands, the vocalists, comperes and the RAF Charitable Trust - which the concert tour is staged in support of. 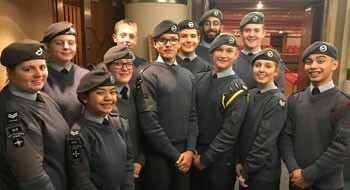 One cadet said: "The RAF in Concert tour is a big highlight in our calendar. It's great to be involved with such a prestigious event and RAF100 makes this year even more special than usual". *The Squadrons that are helping to promote the concert tour are: 2391 Parkstone (Lighthouse, Poole), 2152 Downend (Bristol Cathedral, Bristol), 163 Coventry-Phoenix (Symphony Hall, Birmingham), 231 Norwich (Theatre Royal, Norwich), 2175 Rolls-Royce (Royal Concert Hall, Glasgow), 346 Tynemouth (Sage Gateshead, Gateshead), 1148 Penarth (Wales Millennium Centre, Cardiff), 1136 South Belfast (Waterfront, Belfast), 1359 Beeston (Royal Concert Hall, Nottingham), 312 City of Canterbury (Marlowe Theatre, Canterbury) and Greater Manchester Wing (The Bridgewater Hall, Manchester).